What do they do? Mine's not even producing bubbles. It worries me because the pond's starting to smell bad again. I'll switch 2l ice cream containers again, I don't think that's the problem. Water stones?? I guess you're talking about air stones? If so, do you have them connected up to an air pump - via a air line? Also have you tried running the pools without the air stones and seeing if any bubbles are produced? If so, you have some faulty air stones and I would go back to the store and request a refund. PLZ don't tell me they need a pump as well? Talk about expensive buggers! Crablet they can be a little expensive at first to set up but once set up there are minimal expenses as they eat a lot of the food you eat. You do not always need an airstone in your water pool either. You may find that it is an unnecessary expense right now if it is not needed. What is your current conditions? Temp and humidity? 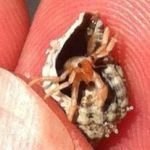 Australia's only online land hermit crab food, treat and accessories store. Stocking many items from flowers, worm castings, mangrove roots, shells and much more. Postage is flat rate Australia wide. There are no limits to what you can accomplish when you are supposed to be doing something else! A small pump is all you need crablet. I got one for $9 at the pet shop. It is quiet and works one airstone easily. I am thinking of getting a splitter and some more cable and adding an airstone in my fresh water as well as my salt water pools. I have 2 litre softdrink bottles with the top cut off as my pools. There are sticks and a fish tank plant in each so the crabs can get out. Once setup they run themselves and don't cost much at all. crablet, what (if anything) do you have your stone connected to now? In honesty I am wondering why your pools would smell bad. You're using something to treat the water for chlorine, etc right? How often are you changing the water? Nat, I check a few times a day. It's a bit hard for them to get food in the pond, none of them are up. The pond has a few shells and a bridgey bit of gutter guard over the floor and a branch to climb in and out. 71%humidity, 27.9 degree...no light, it's their night time! With your humidity at 71% I can see why you wanted to use the air stone. This shows you what you need to do to get the bubbles going in your pool; it really is cheap & easy. Is it better to put a splitter in the tubing, or would I need a pump with 2 outlets? Do you mean so you can have them in both pools at once? Hmmm, that's a tricky question. I think the bubbles would be stronger coming out 2 lines from a double pump but it may be neater tank-wise to run one line into the tank & split it once inside. I'm thinking a pump with 2 outlets would be best, the motor wouldn't overload itself, it'd be doing what it's made to do. Splitting one tube once the tube gets in there may be questionable, depending if they wanna eat the tube or not, it could stuff up both bowls with one hole! Or do what some people do in the fish tank world. They have a dual outlet air pump, connect the two lines until it forms one and then split it up in the tank - to save the few extra cents on airline tubing. However using the normal type of air pump it will be cheaper then buying a dual outlet - especially in australia - however it will not produce a strong flow, however a weaker flow certainly does do well in a water pool as it is so shallow so the water pressure will not affect it. I'm going to use 2 halves of fizzy drink bottles, I have purple silk vines coming so they can climb in and out, tomorrow I'm gonna get pebbles for the bottom, so they won't drown, and I'll have to work out a trailer thing for this wheelchair so I can bring home sand. I bought a single outlet pump for this tank and a dual pump for the big tank. Someone REALLY should tell the crabs I'm not made of money, and I don't have a pet money tree either! I don't know how the pricing runs there but I got my double pumps for about $10 here & they work well. crablet you can try cheaper methods for raising the humidity first if you don't have it in your budget to buy stuff for a bubbler.